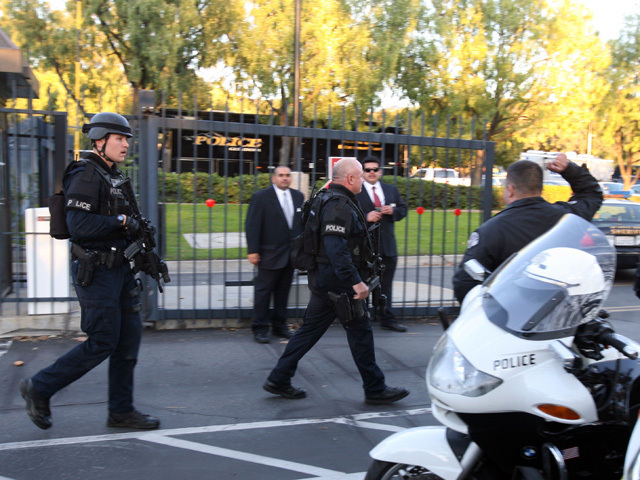 IRWINDALE, Calif. - Three people were killed and two more injured Friday in a California office complex shooting, police said. The suspected gunman was among the dead and is believed to have self-inflicted wounds, Baldwin Park police Capt. Michael Taylor said. "As far as we know there was one shooting suspect, period," Taylor said. The shooting occurred around 1:30 p.m. Friday at Southern California Edison offices inside a larger office complex in Irwindale. There was no immediate word on what prompted the gunfire. Authorities were not saying whether the gunman worked at SoCal Edison or might have been a former employee. Multiple media reports said the gunman was an Edison employee and his two victims were believed to be company managers. Police said they could not confirm those reports. One of the dead was discovered inside the building during a sweep, and police were continuing their search for more victims, said Taylor. Another victim died en route to a hospital. Los Angeles County Sheriff's Lt. Holly Francisco says one woman and one man are currently being treated for life-threatening wounds. Taylor said police have not accounted for everyone in the building yet and were doing a sweep. No gunfire was exchanged after officers arrived. The building was quickly locked down and dozens of people were seen streaming out with their hands raised. Gil Alexander, a spokesman for Southern California Edison, said the company has about 200 employees at the facility. Alexander says the complex is a secured facility and employees need a security card to swipe at the doors before they can be admitted into the building. Alexander called the incident "an enormous tragedy"
The utility's office is in a complex of buildings that also includes a business called California Lighting Sales. Cindy Gutierrez, the controller for that company, said employees there didn't hear any shots fired and didn't realize anything was amiss until building management announced over the intercom that everyone should stay indoors. "At that point we knew something was wrong, then five to 10 minutes later that's when we hear the police," she said, adding that she and her 20 colleagues have been locked in their office ever since. "I'm fine, kind of nervous," she said. Two nearby schools were locked for about two hours after the shooting and no one on the campuses was hurt prior to release. Irwindale is a small industrial city of about 1,400 residents in the San Gabriel Valley, 22 miles east of downtown Los Angeles. It is home to the popular Irwindale Speedway auto racetrack. It is also home to the annual Southern California Renaissance Pleasure Faire as well as sprawling rock and gravel quarries. Southern California Edison is one of its largest companies, employing 2,100 people.